For most of history man has had to fight nature to survive; in this century he is beginning to realize that in order to survive, he must protect it. 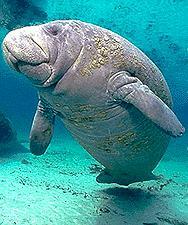 For over 30 years the manatee has been threatened or endangered. This means that it is nearing extinction- there will be no more Manatees! Everyday we make decisions that affect our environment. Can you think of some decisions you make that affect our environment? Are they good decisions or bad? A species particularly at risk because of low or declining numbers or small range, but not a threatened species. A species whose population is not yet low enough to be in immediate danger of extinction, but who certainly faces serious problems. If the problem affecting these species aren't resolved, it is probable that the species will become endangered. The eastern indigo snake and the red kangaroo are examples of threatened species. A species, plant or animal, that is in immediate danger of becoming extinct. Its numbers are usually low, and it needs protection in order to survive. The Siberian tiger, and thousands of other plants and animals are endangered worldwide. An extinct species is one that is no longer living. The passenger pigeon, the dodo, and the Stegosaurus are examples of living species. These animals no longer exist on the earth.